A lot of people ask advice on where to start with schemes. Now, obviously in my job I get to see so many beautiful images and products and it can be hard to whittle them down, but I’m pretty decisive so once I see something I love, I build schemes around it. 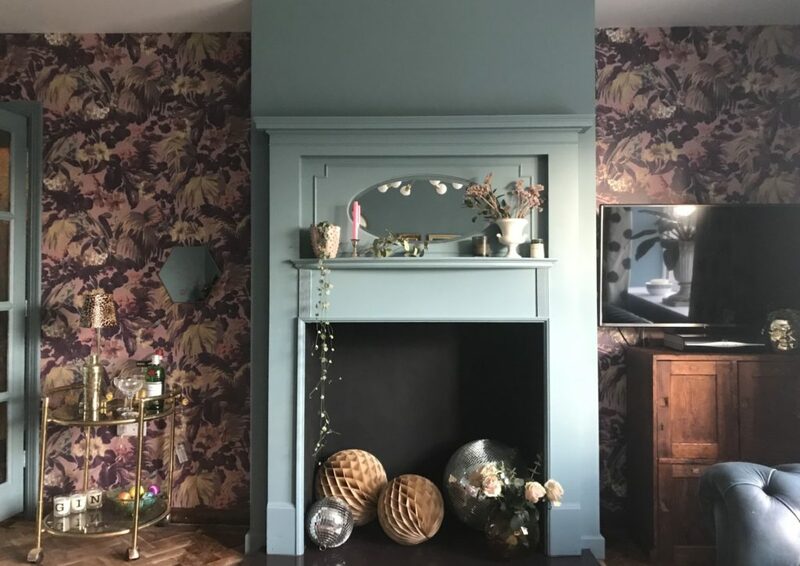 In our lounge the starting point was House of Hackney’s Limerence wallpaper. And whilst I love pink, I wanted a contrast in the paintwork, so I picked up a little blue detail in the paper and took it a bit brighter, step in Paint and Paper Library’s “Blue Gum”. Blue is probably my favourite colour so I’m very comfortable with a lot of blue. I wanted to build a fireplace to make a feature and add character to the room. I’ve always like the 1930’s wooden surround with integrated mirrors, and they can be picked up really reasonably. I picked ours up for £50 on ebay, I love it now that it’s painted, it totally adds character and develops the scheme. When I first set eyes on the curtain fabric, I knew I had to have it, I just love how it works within the scheme. Not usually one for fuss, I knew in the living room that I wanted a pelmet and interlined curtains, they ooze quality and luxury. 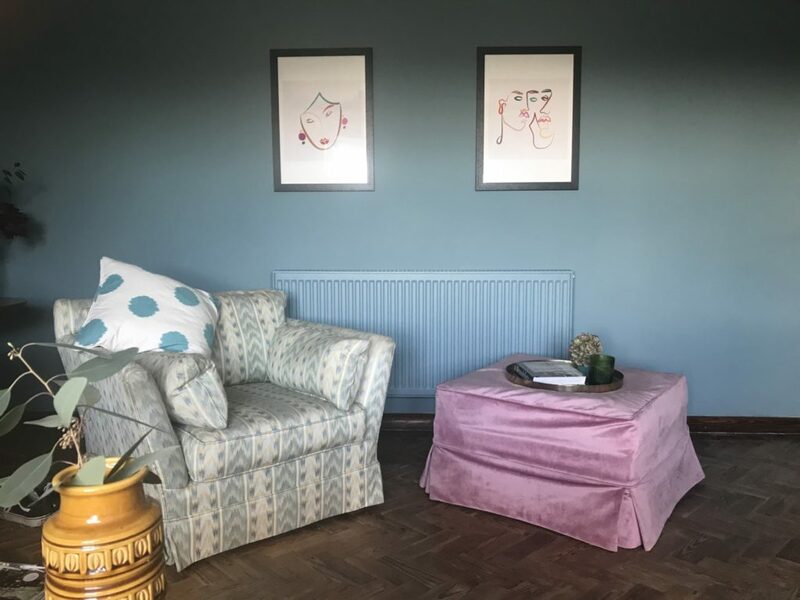 I wanted the lounge to have an opulent feel, somewhere fab that I could relax and entertain in – and it has been tested, and I can safely say it works for both! 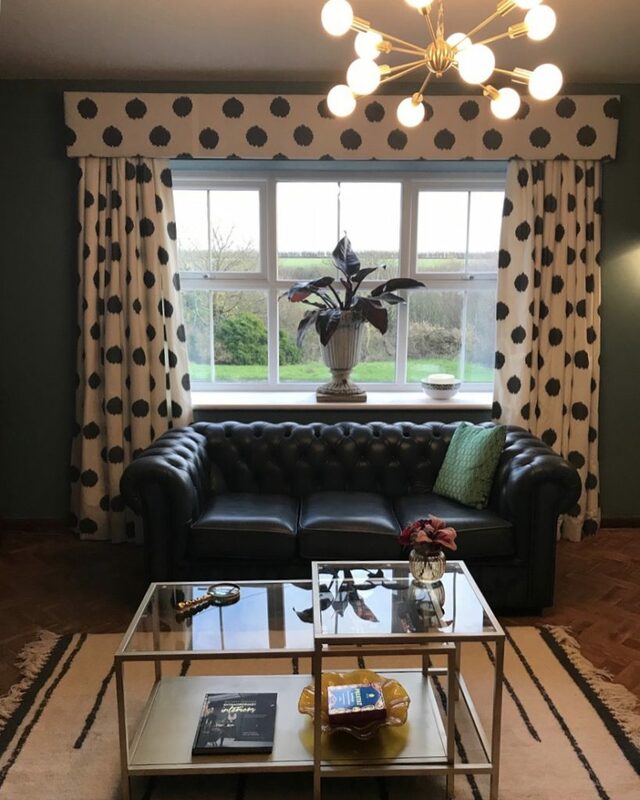 We’ve had the chesterfield for years, and finally it has a place in the house! 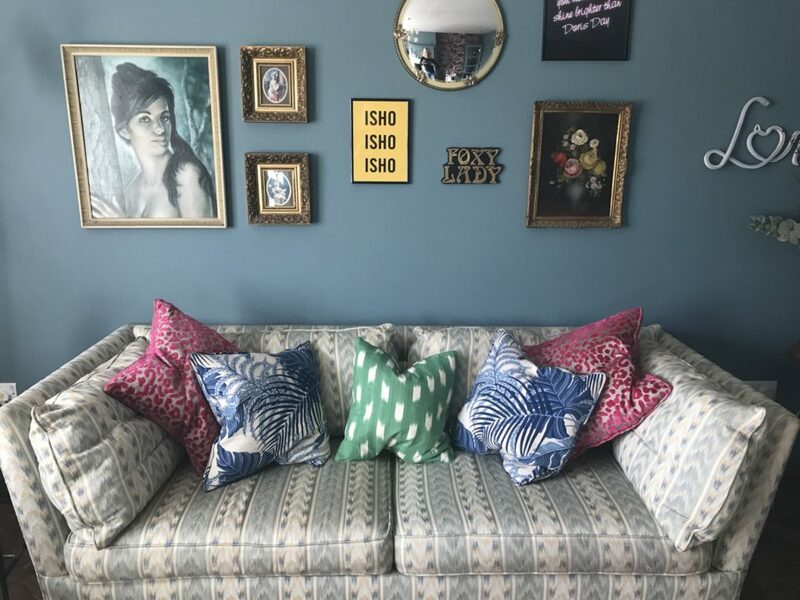 The patterned sofa was given to us, and I love the 80’s Ikat print it works well with the fun cushions thrown on top. I got the footstool recovered in a lovely pink velvet, I’ve styled it with a brass tray, book, vase and scented candle. I will do a separate blog post on how I created the gallery wall, as there are loads of different ways to achieve interesting walls! I chose a brass sputnik light from Marks and Spencer for the main pendant, and the floor lamp is also a mid century inspired light from M & S.
I picked up a little brass and leopard print table lamp from Homesense for the bar cart, and the “Love” light that was previously in our kitchen has been added to the gallery wall, as it’s a great soft light for a corner of the lounge. Styling has also been fun! I have already picked up most things before the lounge was done. 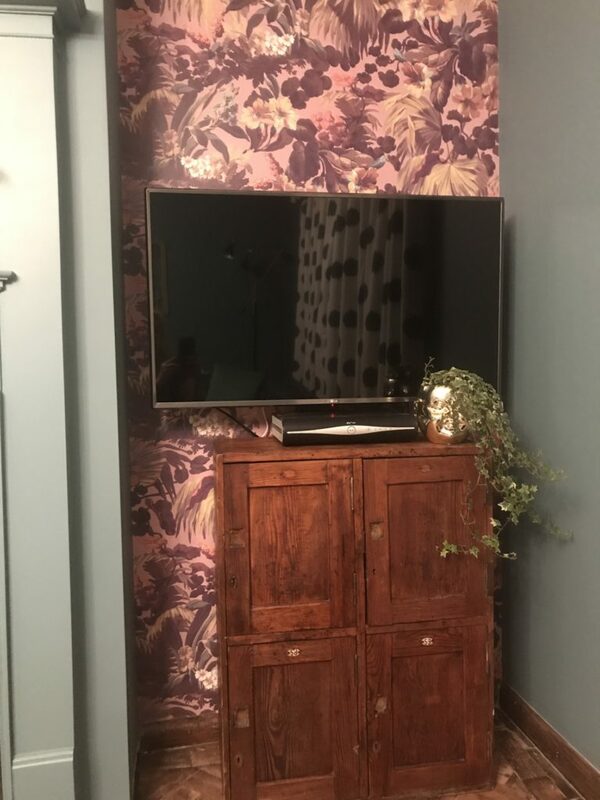 The television is placed on a bracket, so we can push it back to the wall. I picked up the pitch pine locker from Hawthorn Yard in Menai Bridge, and I added the gold doll head vase from the shop with some trailing ivy. 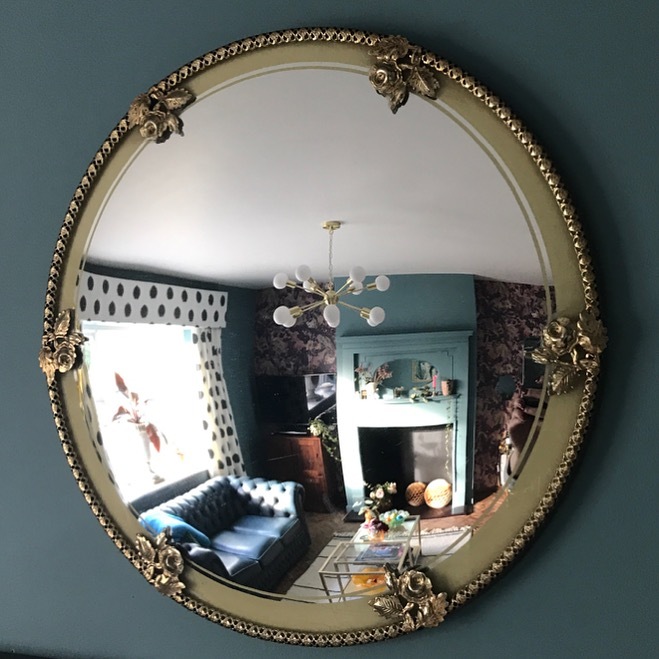 The convex mirror was picked up at my local car boot sale, mirrors are a firm favourite of mine, they add another view of the room and reflect light. 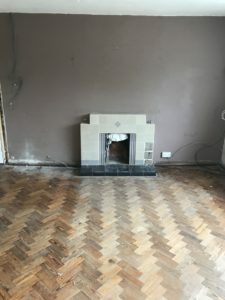 So all in all I’m very pleased, it’s fun, inviting and original, although we do need to sand and polish the floor this year……there’s always a snagging list isn’t there?